Sie waren wieder auf dem Weihnachtsmarkt, beziehungsweise dem Weberglockenmarkt, wie er hier offiziell hieß, auch wenn man ihn trotzdem nur selten so nannte, versackt. Wie immer war es voll und laut gewesen. Gespräche, der Leute um sie herum, Musik, die aus verschiedenen Lautsprechern dröhnte und der generelle Krach, den Ansammlungen von Menschen so mit sich brachten. Aber egal wie oft sie hin gingen oder über den Markt schlenderten, es wurde nicht langweilig. Immer blieben sie an einem anderen Glühweinstand stehen und jedes Mal probierten sie sich ein Stück weiter durch die vielen verschiedenen Sorten. Es gab Stände, die hatten einige davon. Normalen Glühwein konnte man überall bekommen, aber einige boten ihn auch mit Himbeer-, Johannisbeer- oder Sanddorngeschmack an, es gab aber auch Eierpunsch und Grog. Wenn sie nichts ausprobieren wollten, trafen sie sich meist mit Freunden an den Ständen, die ihnen am Besten gefielen. Auf welche Art auch immer, gingen sie aber häufig und gern. Jetzt waren sie aber außerhalb der Reichweite des weihnachtlichen Trubels. Noch ein Stückchen am Wall entlang zu gehen war für sie immer ein netter Abschluss für einen gelungenen Abend. Der Wall, der das Stadtzentrum umgab war zwar nicht so stark dekoriert wie die Innenstadt, aber es war immer wieder schön anzusehen wie die alte Stadtmauer und die darin eingebauten Wiekhäuser beleuchtet und mit Schnee bedeckt waren. Die alten Bauten brachten einen Hauch von Vergangenheit in die Hektik der Gegenwart. Auf ihre Art zeugten sie von der Ruhe, die die Weihnachtszeit ebenso mit sich brachte, so wie die Feiern und Märkte für die Freude und Heiterkeit standen. They had stayed at the Christmas market again, or rather the Weberglockenmarkt as it was officially called here, yet only rarely referred to as such. As always had it been loud and full of people. Conversations of the ones around them, music booming out of different speakers and the general noise a crowd of people made. But regardless how often they went to or walked across the market, they didn’t get bored. Every time they stopped at a different booth for the hot spiced wine and each time they tasted some more of the different flavours. Some booths had several of them. You could get the normal Glühwein everywhere, but some had it mixed with raspberry, currant or sea buckthorn, but there was also eggnog and grog. When they didn’t want to try anything they usually met up with friends at the booths they liked most. However they did it, they went often and liked it every time. Now they were out of reach of the Christmassy hustle and bustle. It was a nice way to end a good evening for them by walking a bit along the city wall. The wall, that surrounded the city centre wasn’t decorated as much as the centre, but it was always nice to see how it and the integrated Wiek houses were illuminated and covered by the snow. The old buildings brought a whiff of the past into the bustle of the present. In their own way did they portray the calmness that the Christmas time brought with it, just as the celebrations and markets symbolised the joy and cheerfulness. I hope you enjoyed the eighteenth story. This time I do believe I have to tell you a bit more about the location that are mentioned and shown. Last year I talked about the Weberglockenmarkt and its story in my Christmas post, but I have yet to tell you about the layout of the city centre of Neubrandenburg. The city centre is surrounded by a ring-wall that is part of the European Route of Brick Gothic. 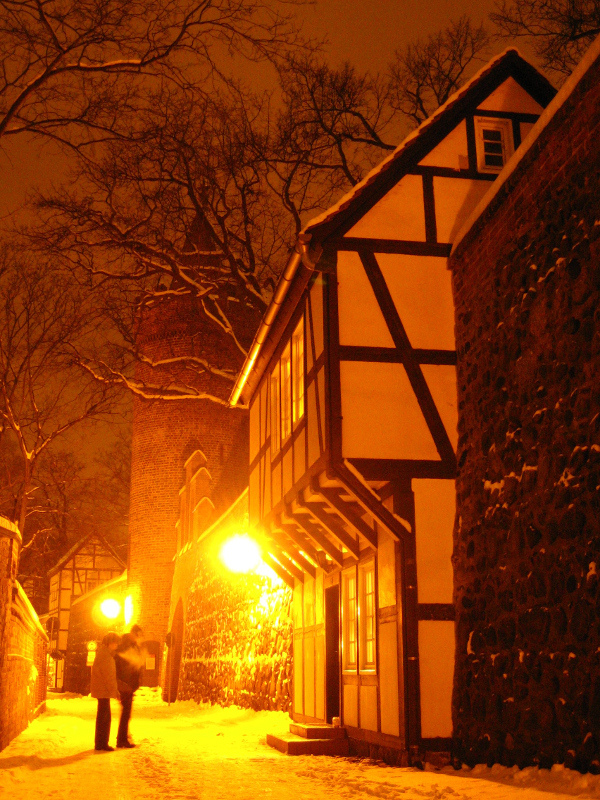 A Part of this wall are not just the eponymous four medieval gates (Neubrandenburg is also called the City of Four Gates), but also timbered Wiek houses (Wiekhäuser, as you can see in the picture) that were used as additional defence buildings. By now the few that remain hold homes, restaurants, insurance companies and other offices. Around this brick wall are two rings of trenches that are separated by another earthen ridge, all of this is covered in all kind of greenery and tress, creating a small forest within the city. When you walk here you barely hear the noise of the cars that use the three-lane ring-road surrounding the centre. I always enjoy walking beside the wall and some day I’ll participate in one of the guided tours to learn more about it.